*The Washington Spirit acquired Taylor Smith via trade with the North Carolina Courage on January 16, 2018. 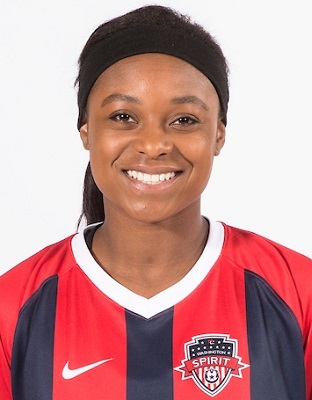 2018: In her first season with the Spirit, Smith played in 23 regular season games, starting all of them. She totaled 2,064 minutes of playing time, racking up 61 clearances and 33 interceptions as a key member of Washington’s back line. 2017: Smith played in 26 games for the North Carolina Courage, starting 20 for a total of 1,852 minutes. She recorded two assists and eight shots. 2016: Started in five out of 18 games played for the Western New York Flash, logging 726 minutes. Scored two goals in 2016. Smith was called up to participate in the US Women’s National Team winter training camp in Carson, California in 2017. Since then, she’s made five appearances for the USWNT including three starts…In 2015, she scored game-winning goal against England to help the Team USA U-23’s win the Four Nations Tournament. Has represented Team USA on the U-14, U-18, U-20, and U-23 teams. Started 80 games for the Bruins, scoring 27 goals and 22 assists in 4 seasons. 2015: Played and started in 14 games. Scored 2 goals and 2 assists. 2014: Started all 24 games for the Bruins and was second on the team in goals scored with 9. 2013: Scored 8 goals and had 11 assists during UCLA’s National Championship season. Played in all 26 games and started 25. First team All-Pac12 selection. 2012: Played in all 23 games and started the final 17 games. Ranked second on the team in goals with 8.